London Hilton on Park Lane overlooks Hyde Park and offers stunning views from every guest room and suite. The hotel is close to London’s main attractions, including theatres, world-famous landmarks such as Buckingham Palace, and the vibrant shopping districts of Oxford Street, Knightsbridge and Bond Street. 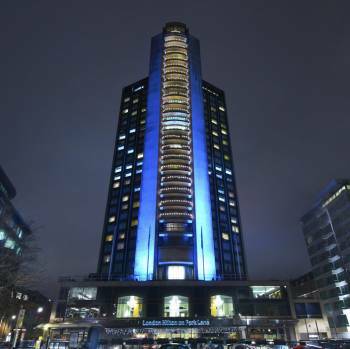 London Hilton on Park Lane is famed for its service and prestigious Park Lane location. The hotel’s proximity to the underground stations of Hyde Park and Green Park makes it the perfect base from which to explore London’s sights.Boasting a range of famous London restaurants and bars, our Park Lane hotel offers a culinary journey starting with breakfast at Hilton at Podium Restaurant and Bar. Sample our Confessions of a Chocoholic afternoon tea, followed by Champagne in our elegant CC Bar. For dining with a Tiki twist, visit the Polynesian-inspired Trader Vic’s. Enjoy Michelin-starred, French haute cuisine at Galvin at Windows on the 28th floor. End the day at top celebrity nightspot, Whisky Mist at Zeta.Work off the day’s stresses at our Mayfair hotel’s on-site gym. Set a new personal best using the Precor equipment, available 24 hours a day, or indulge in pure luxury at ‘Spa To You’ with a facial, treatment or pedicure.London Hilton on Park Lane offers a wide range of meeting and event space for any occasion, from small business meetings to glamorous award dinners and stylish weddings. With 8 flexible meetings rooms, all offering natural daylight, Hilton Meetings on the fourth floor is the ideal venue for presentations, board meetings and receptions, catering for up to 50 guests. All meeting rooms boast a modern look and feel following a half a million pound refurbishment transforming them into retro chic spaces.On hand is a Business Centre with a dedicated Meetings Manager to assist all your needs from 7am to 7pm, Monday to Friday.From the latest AV equipment, video conferencing and online facilities, to freshly brewed tea and coffee and a flexible choice of food and drink menus, you’ll find everything you need to make your meeting a success at the London Hilton on Park Lane hotel.